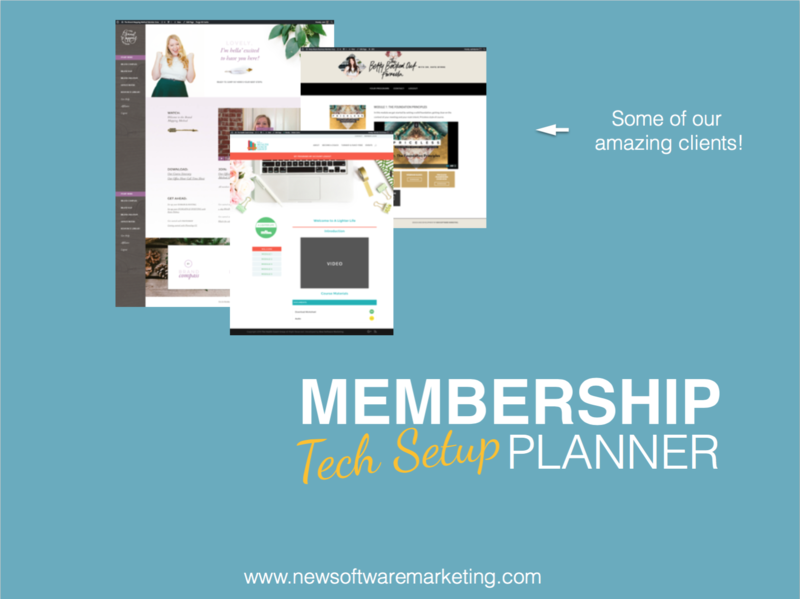 READY TO BUILD YOUR MEMBERSHIP SITE? Check out our latest live pitch-free workshop! LOOKING FOR AN INFUSIONSOFT EXPERT THAT CAN SUPPORT YOU & YOUR BUSINESS? Head over to http://newsoftwaremarketing.com for more information. LOOKING FOR A TEAM OF EXPERT DEVELOPERS FOR YOUR WEBSITE OR NEXT ECOURSE OR LAUNCH? LOOKING FOR A TECH TEAM TO MAINTAIN YOUR WORDPRESS WEBSITE? Our maintenance program takes care of all your backups, updates of WordPress,theme and plugins so that you can focus on money generating activities. It has been invaluable to have Nathalie Doremieux, an AmbitionAlly Certified Partner, helping me every step of the way. She set everything up to run seamlessly with Infusionsoft. Having the support of both Nathalie Lussier and Nathalie Doremieux during my first big launch made all the difference. Not only does my members area look the way I want it to, it also has the back-end functionality that I need to automate and grow my offerings. From great customer service to beautiful design, I can’t say enough about AccessAlly and Nathalie Doremieux’s services! “Before I found Olivier and WP Help Club, I was completely frustrated with our website programming. I’d gone through dozens of programmers (literally!) and while some of them were good, they all lacked something, and I couldn’t find what I was really searching for: an extremely talented, reliable, FAST WordPress specialist. Naturally, I was skeptical when I hired Olivier, but he very quickly won me over, and that’s not easy to do! He works fast, his communication is excellent and he delivers what he says he will do. Olivier isn’t just a WordPress hack, either; he’s a programmer with a deep level of skill that transcends the WordPress environment. Not only did Olivier fulfill our expectations, he found and solved problems that I didn’t even know I had! After noticing that our site was loading slowly, he took it upon himself to contact our host to clean up our account. This is just one example of how he goes above and beyond. As a result of working with Olivier, we have a fully functional “event” site that we can reuse and repurpose, an effective lead capture mechanism on our website, and best of all, a reliable programmer we can call on in times of need. “Just wanted to shout out Nathalie Doremieux. Best Developer ever. So committed. Love her work ethic and love her!!!! I have a beautifully built site that is beyond my expectations. It takes into consideration both form and function. I know that you are a TRUE PRO. You are part of my team! I know you have my best interest at heart when you suggest anything. The orientation video that you created for me and my site is a huge value. I absolutely loved the succinct and clear instruction on how to do the primary functions of maintaining and updating my site. It was so empowering and helpful. I have referred to it several times. From the beginning of the work together there was a plan which I would not have been able to complete without Nathalie’s knowledge of the system and processes. Nathalie is a very professional and understanding of your business needs and it will deliver over the 100% mark…is that what we all say OVERdeliver. She will keep you on track of the tasks in hand and will not let you deviate from your goal. Since we started working together, I have an incredible website that serves as my platform, helps to raise up my brand, and create a professional look. I love that you are so friendly and easy to get a hold of, I never feel like I need to wait long before I hear back from you. You go above and beyond as far as customer service, I LOVED all of the videos and tutorials you have done for me. You have helped me to learn how to do some of the backend stuff on my own. You are very professional and get things done quickly and perfectly. I liked how quickly everything moved forward and how you tweaked it until it was perfect! I have sold prints through my website and have been able to direct people to my website for information about commissioned paintings as well. It’s so nice having a place that represents me and my brand that is clean and beautiful! I have had a few brands/companies reach out to me to work together! I don’t think that would be happening if I was still only on Etsy. I would recommend you to anyone who is looking to build a website! It was such a painless and fun process! The most important thing to me is that you really listen and care about your clients! I feel like right off the bat you understood my vision for the website and I really appreciated that! When you signup to receive the top tools lit you also signup to our newsletter. If you do not wish to receive it, simply click on the unsubscribe button of the first email and we won't bug you ever again, promise. Ready to build your first or next E-Course? Not sure where to start? Grab our Membership Tech Setup planner : tools and all the questions you need to ask yourself before you start. When you signup to receive your top tools list you're also signing up for our newsletter. If you don't wish to receive it simply unsubscribe at the bottom of the first email.